From the NMV (Data Management/Shares), select the CIFS checkbox to share with defaults (including anonymous read/write). Edit the share and rename it SYSVOL – uncheck “Anonymouns Read-Write” before saving. 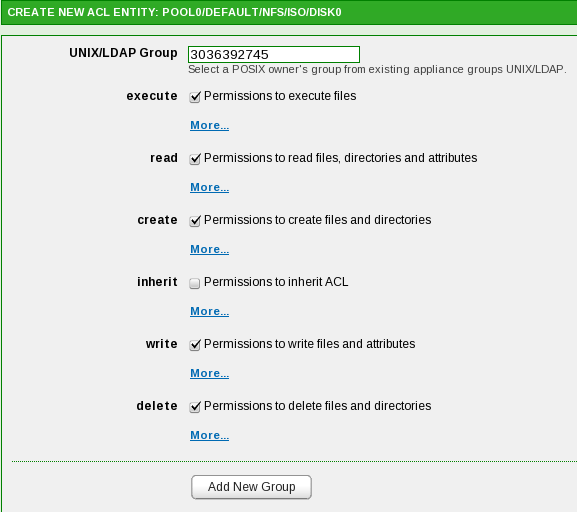 Within the “Create New ACL Entity” control box, we insert the GID of our “Domain Admins” group, and check all of the extended “read” permissions. 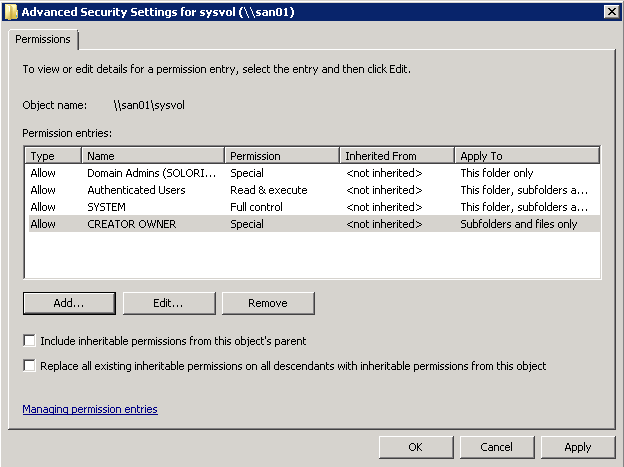 Additionally, we check the “delete” permission, and intentionally leave the “inherit” permission disabled. 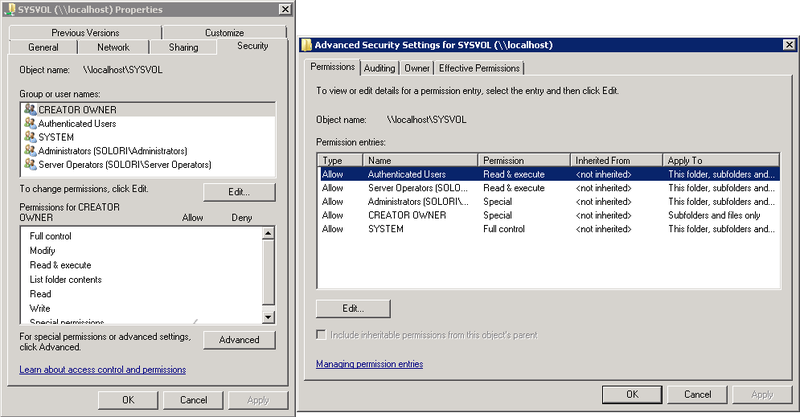 With these permissions applied, we can begin adding additional permissions from the Windows browser. Why is this an important shift of administrative control? Not all permutations of ACL options are available from the NMV. For instance, it would be impossible to set the complex permissions for Administrator on NETLOGON from the NMV since there are actually two sets of permissions for the same user at that level. As a Windows domain administrator (group), use a file browser to find the share (i.e. \\NAS_NAME) and right click on the “sysvol” share and select the security tab. You may note that there are three unexpected group permissions already enabled on the share: Everyone, Current Owner and Current Group. Do not delete these NAS permissions until later. 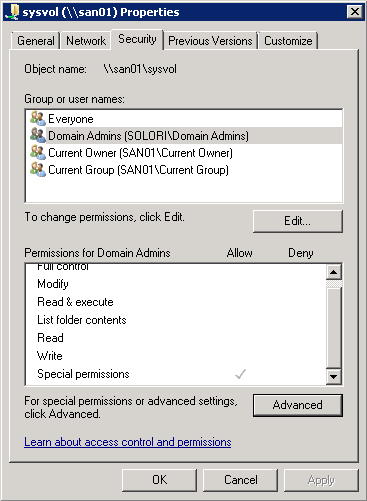 We can start with deleting the extra SAN-based permissions – Everyone, Current Owner and Current Group. Next, we’ll add permissions for Authenticated Users, SYSTEM and CREATOR OWNER. Do so by clicking the “Advanced” button, then the “Edit” button on the Advanced Security Settings window, and finally “Add…” on the resulting pop-up requester. Type in “Authenticated Users” and click the “Check Names” button to confirm the spelling, then click “OK.” Make sure the “Apply to” section lists “This folder, subfolders and files” and check the following: Traverse folder, List folder, Read attributes, Read extended attributes, Read permissions – then click OK. The “Authenticated Users” group should now show “Read & execute” permissions for this share. The NexentaStor appliance will not have an analog to “Server Operators” from the Windows Server built-ins. 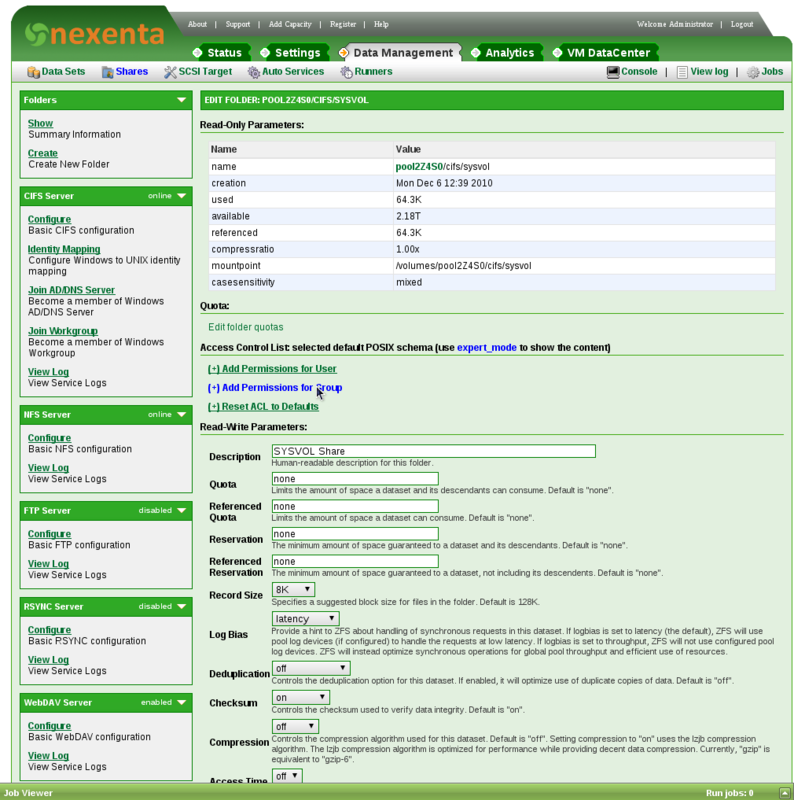 To see the NexentaStor built-ins, click the “Locations…” button and select the NAS at the top of the tree, then, select the “Advanced…” button and click “Find Now…” on the subsequent pop-up. It does have an Administrators group and a Backup Operators group – we’ll use these to stand-in for our remaining groups. 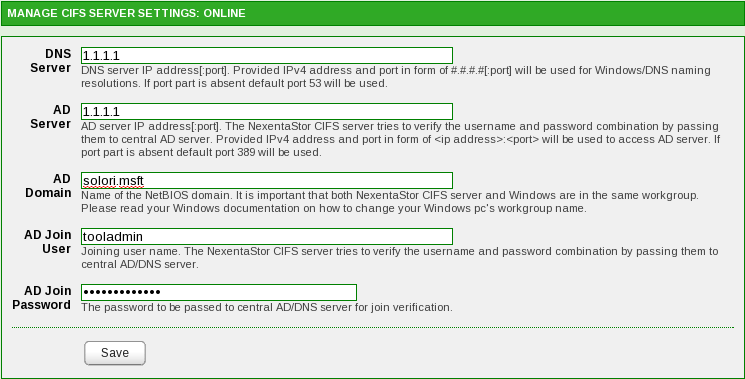 This is an excellent post covering one of the most frustrating setup steps of Nexenta. Thanks for the assistance on our clients configuration, I believe that following what you had already provided me with I have managed to put a working solution in place. I’m definitely going to be in touch again when we start those larger projects. Excellent post. 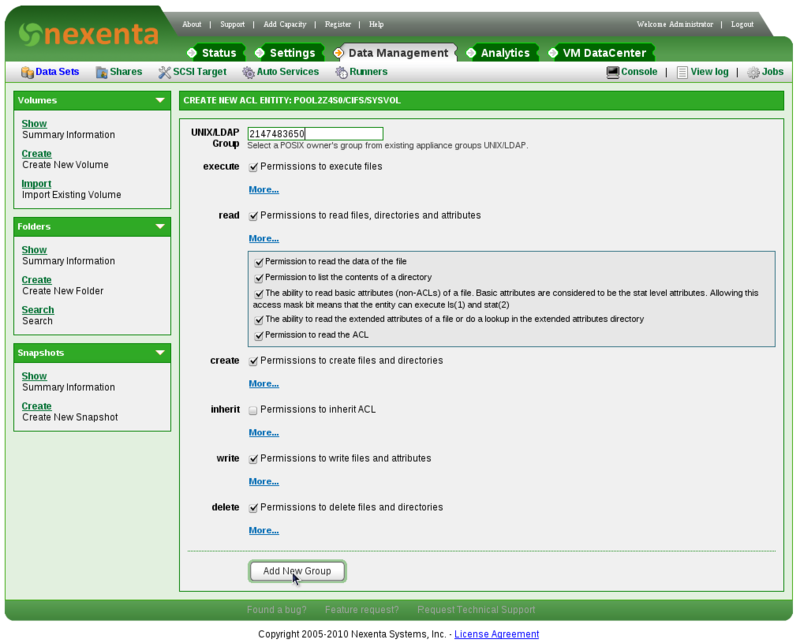 You shed light on a very confusing and sparsely documented aspect of using a Nexenta box in a Windows environment. Thanks! Thanks! Any insights you have garnered with your deployment would be welcome.